We have been, in this column, following the new Hudson Valley Art Trail and highlighting some of the great landscape art that was done in our region. Our focus, however, is to see how this landscape was influenced by the Ice Age. Our thesis is that it was the glaciers that sculpted these landscapes long before they were ever painted. We are scientists who have a deep appreciation for the broad and gradational boundaries where science blends into art. Stay with us on this theme as we write this series. Today let’s go to Olana, Frederic Church’s Persian Revival mansion high atop a hill overlooking a sweeping vista of the Hudson Valley. It’s stop number two on the Art Trail. Church was, arguably, the most successful of all the Hudson Valley artists. His career began when he was a student of Thomas Cole. It was Cole who guided the young Church in developing his skills and he certainly influenced Church into becoming the great landscape artist that history remembers. One of those influential moments occurred when Cole and Church climbed what would come to be called “Church Hill,” east of what is today the Rip Van Winkle Bridge. Church must have been most impressed with the view; you look south and see, before you, the Hudson River and much of the Hudson Valley. 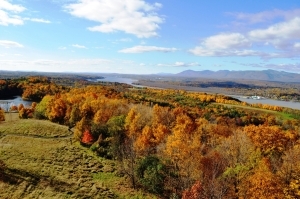 In the distance was an unsurpassed vista of the Catskill Front and beyond the Shawangunks. The view is a natural kaleidoscope; it is never exactly the same from one moment to the next. As the sun and clouds pass across the sky, the light and shadows change continuously. The experience is compelling; your gaze is irresistibly drawn towards the valley view and you drift into an almost hypnotic state. Frederic Church would someday own that view. He would build his palace, Olana, there. It would become a work of landscape art. His south porch would face that hypnotic view and it still does. Church, during the last third of his life, developed a number of locations on his property as “planned views.” These were sites where the trees were cleared and view opened up, purely for the art of it. Since his time, those clearings slowly became overgrown with trees and shrubs, blocking those magnificent views. But in recent years some of them have been restored. The 200 or so acres that are Olana will again be the work of art that Church intended all along. Church Hill is the product of the Ice Age – entirely. Church hill, when seen from high above, is a beautifully sculpted, symmetrical, teardrop shaped hill. It almost seems unnatural; surely some manmade process shaped it. But it is quite natural; it is an ice age feature called a rock drumlin. Starting more than 20,000 years ago, the Hudson Valley glacier began overriding this sizable knob of bedrock. That rock is part of the Normanskill Formation, and it is largely dark sandstone and black shale. By rock standards, that is actually pretty soft stuff, so it was not surprising that the passing ice might begin to cut into it. For 10,000 years or so that advance of the ice continued, on and off, during several major chapters of glaciation. Each advance of the ice brought a new episode of erosion into the bedrock. And each episode improved the shaping of the hill. Most drumlins are not composed of bedrock; they are made mostly of sand, gravel, and cobbles. This material comes to be shaped into a very predictable form. We liken that to the shape of an upside down teaspoon bowl. These typical drumlins are stretched out, north to south. The north-facing slopes are the steepest; the south facing ones taper down at a more gentle angle. The left and right flanks of drumlins are symmetrical, with steep slopes and a sharp crest in between. Rock drumlins are the same, just composed of shaped bedrock, not gravel. Olana was placed at the top of the spoon bowl, at the crest of the drumlin. Its south porch faces the south, tapered slope and that afforded it its spectacular view. Two of the other planned views that you can visit today are on the Ridge Road. They are perched on the flanks of the rock drumlin. One looks west across the Rip Van Winkle Bridge, while the other looks northeast. More will be developed with time. Frederic Church certainly appreciated his landscapes, but did he understand the ice age nature of this all? That is not entirely clear. Church was fascinated by the polar landscapes of today’s world. He painted them in some of his most memorable works. See his Aurora Borealis (1865) or The icebergs (1861.) Church did know something about geology and he lived in a time when geologists had learned a great deal about our ice age history. But how much did Church understand about the ice age history of Olana? We really don’t know. His library contains several geology books but they do not offer inscriptions that might help us fathom his thinking on this matter. We hope he did; we would like it if he could have seen Olana as we do. When we stand on the south porch at Olana we are, like anyone else, captivated by the view. We sit and watch as it changes before us, and it is a wonder. We are envious of Church’s 30 years living here and his experiencing all this for all that time. But we probably see the view differently from how he did. In our mind’s eyes we travel to this site when it was at the bottom of a moving glacier. The cold is unbearable, but worse is the absence of sunlight. At the bottom of the thick ice all is in pitch black darkness. But although we cannot see, we can hear the sounds above as the glacier moves, making low groans and sudden sharp cracks. But below and all around we hear grinding noises. Cobbles and boulders are being dragged across the bedrock. Contact the authors at randjtitus@prodigy.net Join their facebook page The Catskill Geologist.